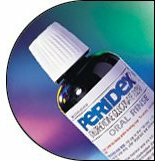 PerioMed and Peridex® are prescription mouth rinses that reduce the redness, swelling and bleeding of gums caused by gingivitis. Dr. Dunn or Dr. Bowling may prescribe these medications for use between visits.